We are a Sandy Hook, NJ charter fishing business that was incorporated in 2004 located in Monmouth County, NJ. We are docked at the Highlands, NJ. Call the number below for directions or click here. 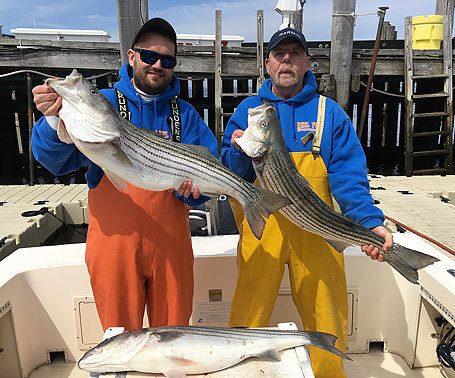 Our charters are for up to 4 anglers fishing the waters of Raritan and Sandy Hook Bays and numerous inshore Monmouth County wreck and reef ocean locations. Reel Fun Sportfishing specializes in bait and lure fishing for Striped Bass as well as bucktailing, our specialty, for Fluke (Summer Flounder). We also bottom fish for Sea Bass, Blackfish and Porgies. We offer all the amenities for a pleasant and memorable fishing trip for both novice as well as the seasoned angler. We'll teach you all the current methods of fishing for Stripers (clamming, eeling, bunker chunking or livelining as well as casting and retrieving lures), jigging (aka: bucktailing) for Fluke as well as how to bottom fish for those hard fighting and stubborn Sea Bass and Blackfish. With Reel Fun Sportfishing you may pay a little more per person, but you get so much more.....state of the art rods and reels (no extra rental rod charge or, of course, you can bring your own), instructions by our outstanding crew on how to catch your favorite fish, fresh baits that catch more fish, highly trained , responsible mates and captains, state of the art electronics for your safety on a seaworthy vessel, and most of all, a friendly, family atmosphere where our first time customers become lifelong members of our "Reel Fun Family of Anglers". Why not join us and see what a great charter fishing experience is really like! **Charter fishing/guide service from April through November. **Fully insured USCG licensed captains. **Learn to fish with our friendly and knowledgeable crew. **Fishing for seasonal inshore species. **The finest quality rods, reels and bait at no extra charge. **Catering to both experienced as well as the novice fisherman. ** 8 hour "Duke of Fluke" Marathon. **Advance notification of inclement weather conditions.